Nakhjavani, M., Nikounezhad, N., H. Shirazi, F. (2014). Effects of Cells Density and Positioning on Optimized FTIR Biospectroscopy. Iranian Journal of Pharmaceutical Sciences, 10(2), 61-68. Maryam Nakhjavani; Nastaran Nikounezhad; Farshad H. Shirazi. "Effects of Cells Density and Positioning on Optimized FTIR Biospectroscopy". 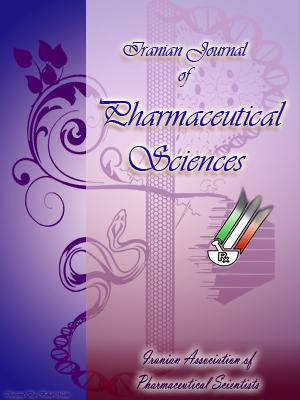 Iranian Journal of Pharmaceutical Sciences, 10, 2, 2014, 61-68. Nakhjavani, M., Nikounezhad, N., H. Shirazi, F. (2014). 'Effects of Cells Density and Positioning on Optimized FTIR Biospectroscopy', Iranian Journal of Pharmaceutical Sciences, 10(2), pp. 61-68. Nakhjavani, M., Nikounezhad, N., H. Shirazi, F. Effects of Cells Density and Positioning on Optimized FTIR Biospectroscopy. Iranian Journal of Pharmaceutical Sciences, 2014; 10(2): 61-68. 1Department of Toxico/Pharmacology, School of Pharmacy, ShahidBeheshti Medical University, Tehran, Iran. 2Department of Toxico/Pharmacology, School of Pharmacy, ShahidBeheshti Medical University, Tehran, Iran. Pharmaceutical Sciences Research Center, ShahidBeheshti Medical University, Tehran, Iran. Researchers have found a big interest in biological application of Fourier Transform Infrared (FTIR) spectroscopy. Evaluating many diseases, staging them and studying the chemical structures of different formed compounds in diseases are some of the research applications of FTIR. Cancer is also one of these diseases. Researchers are trying to set up FTIR methods to detect and diagnose cancer cells and follow up the treatment steps using FTIR. In this regard, cancer cells and tissues are under investigation. In order to study cancer cells in lab, it is important to find out the proper cell density on the disk, at the first step. In this regard, the effect of different densities and positioning of cancer cells on FTIR supporting disk are studied in the present project. At the first step calibration of the instrument is checked using bovine serum albumin (BSA). Cancer cells were collected from culture dishes and washed with normal saline, twice. Different concentrations of cells (10000-320000 cells/uL) were located on ZnSe disks and dried prior to spectroscopy. The samples were scanned in the mid-infrared range of 4000-400 cm-1, with the resolution of 2 cm-1. Each spectrum was collected by 100 sample scans. Microscopic images of the disk were also taken to find out the distribution of the cells on the disk. The results of this study showed that the right amount of cell number and positioning on the disk is a very important parameter in bio-spectroscopic quality for biological purposes.